Kids these days are so spoilt. They get branded clothes, good food and ridiculously expensive haircuts. During my time, I never had such luxury. All my clothes were from departmental stores and pasar malam, I ate at home most of the time and got my hair cut by my mother. It was just one step better than putting a bowl on my head and cutting the hair according to that shape. Grandpa celebrated his 79th birthday yesterday, and his children decided to take him to Nilai for dinner. 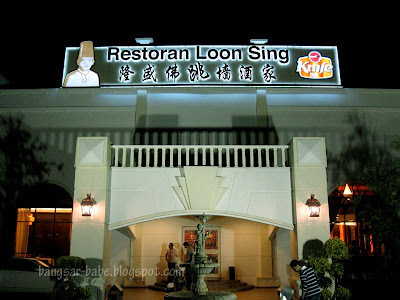 Restaurant Loon Sing to be exact. “What?? Go so far for dinner?” I asked. “You’re one to talk. Who drove to Batu Pahat for lunch?” said mum. My aunt did the booking and the ordering, since she dines there more often than the rest of us. 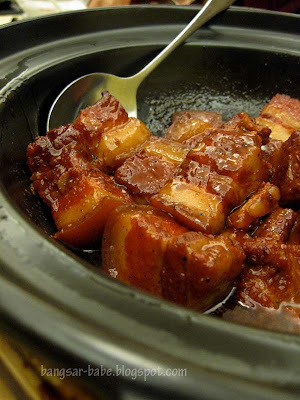 According to her, the restaurant serves good Fuzhou food. Everything in menu is written in Chinese, so I don’t know the exact names of the dishes. 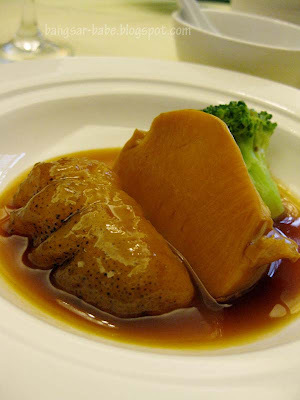 I think this was braised abalone with sea cucumber. 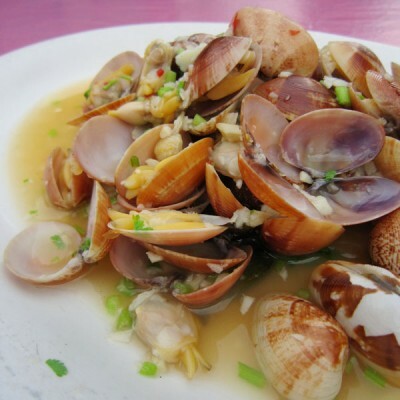 It was a good abalone — firm and slightly chewy with a slight sweetness. I would have liked another one. The waitress must have taken a look at me and concluded I don’t eat much. My abalone was the smallest! Monk Jumps over The Wall (fat tiu cheung). 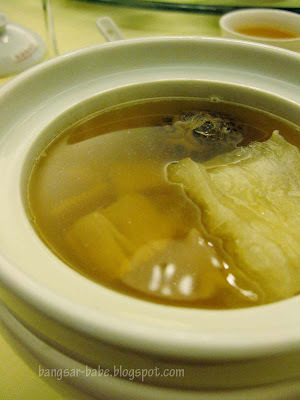 The scallops were bursting with sweetness and the double boiled soup packed a lot of flavour. I helped myself to the chicken that was left behind in the bowl. Very tender and well-infused with herbs. Another soup. 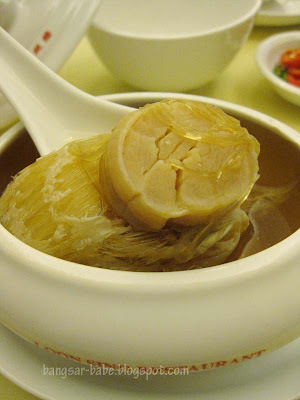 But this time, it was shark fin soup with scallops. My 9-year old cousin insisted on the biggest scallop, and even took her big sister’s portion. As she sat there eating the scallops, I had a gut feeling her future husband would have a hard time trying to feed her. 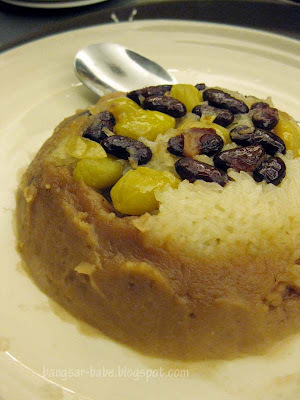 Dong Po Yoke with red rice wine. I wasn’t impressed with this. The gravy was too sweet and the pork fat wasn’t soft enough. This came with steamed mantau buns. 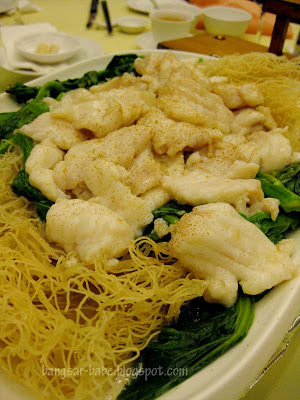 Fried vermicelli with fish slices. Honestly, I didn’t like this dish. It was almost bland with little or no aroma. 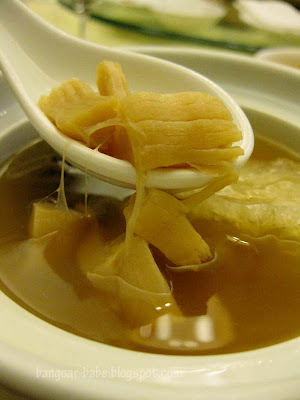 The gravy was more starchy than flavourful but the fish slices were succulent and sweet. The mini salted egg chang salted egg was just as bland. Prawn with salad sauce. 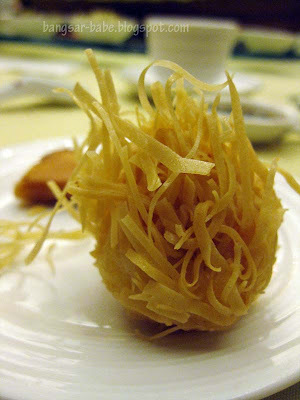 Similar to the fried prawn fritters often found at dim sum restaurants, but nicer. The prawns were very fresh, and I liked the way the chef prepared the outer layer — crispy and light. 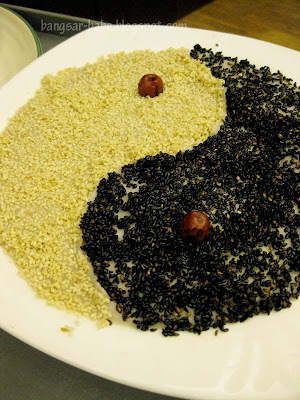 ‘Yin Yang’ Yam Paste and Yam with Glutinous Rice. 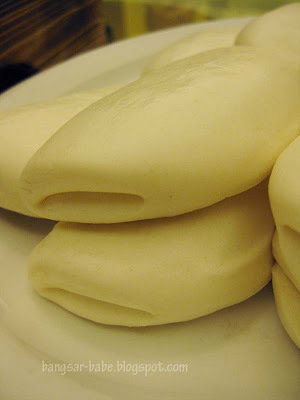 The latter was my favourite Fuzhou dessert, but I didn’t like the way it was prepared at Loon Sing. I found the yam very starch-like and flavourless. Dad’s grandaunt in Sitiawan makes a better version. The yam paste was worst. Its texture reminded me of baby food. 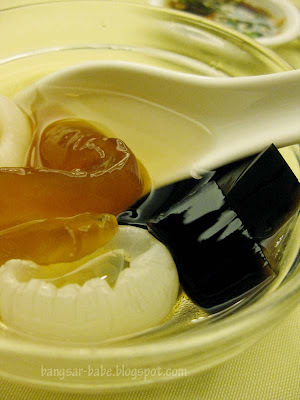 Longan with sea coconut soup was nothing to shout about. 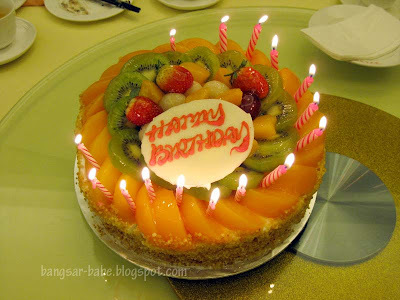 Grandpa’s cake was from Berry’s; I don’t know who bought it. I may be terribly spoilt by FBB and Just Heavenly cakes, but I eat normal cakes too. My 9-year old cousin actually announced that she doesn’t eat Berry’s cake, and that it was not good enough for her. At that point, I wanted to smack some humility into her. Geez….kids these days! I think the dinner costed RM2020 per table. Very expensive and the food was honestly not that great. Verdict: Average and pricey food. Not something I would want to eat or pay for. The place for Monk Jump Over the Wall. But seems to be over rated if your from ur rating. Totally agreed, the foods have deteriorated since they have move to this new location. "As she sat there eating the scallops, I had a gut feeling her future husband would have a hard time trying to feed her. " the chef's dad is an award winning chef-last year they served an 8 course only pork dinner for an association. aiyo..my first :Monk Jumpover the wall" was jz last Fri. Imagine! 28 di only get to eat! somemore free one! LOL. nomad – LOL…nice or not? Sean – LOL. Why? Did they use a coconut shell to shape your hair?? I don't see why it would be extreme for someone to say she doesn't eat whatever. People have preferences whatever their ages are. I don't like durians. I tried it once when I was 9, and since then I have been saying I don't like them. B – She said Berry's cake was not good enough for her. Having a preference or being snobbish about it are two different things. You may prefer cake A to cake B. But if you don't take cake B because 'it's not good enough for you'…that's just snobbish. Well she has high standards. It's time someone in the country had high standards. The "good enough" culture has led to so many things becing "good enough" that the culture of excellence is practically non-existent in this country. B – Let's hope she can apply this 'high standard' of hers in future life. Because at this rate she's going, she's merely a classic example of a terribly pampered child. I juz hv my wedding dinner held at this restaurant. The food there wasn’t so good as other ppl were saying. A lot of my Seremban friends who been ate there before said the food were used to b good when it was under his father management. 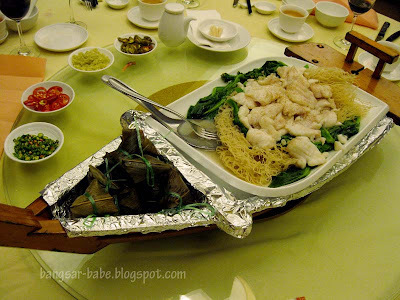 Nowaday the food were deteriorate…not longer tat tasty. Another thing I would like to said is their service is extremely bad….no one serve tea…..n they count every penny….if u din take their liquor….they will giv u bad service…while i was there discuss d detail wif them….they promise to turn on AC by 5:00pm. But on tat day, they reject to do so…n told us tat our guest havent arrive by after 6:00pm. This is really a ridiculous reason. I personally won’t choose this restaurant for any function. There are not good.